Dinner last night at Cafe LuMar, a little Croatian restaurant on the south side of Colorado half a block east of Myrtle. I got the schnitzel ($16.95) and it was excellent! As was the Croatian beer ($6.50). Everything was very fresh. It came with spinach, mashed potatoes (covered by the schnitzel here) and a tangy cabbage salad. I've also had the goulash here, and my wife loves the crepes. It's all excellent and the service is very pleasant. 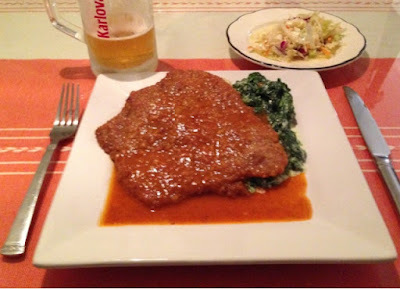 I can't resist telling part of my schnitzel story. I've had quite a few schnitzels in Germany, but one of the best I ever had was in Osaka, Japan. I won't tell the whole story. Too long.